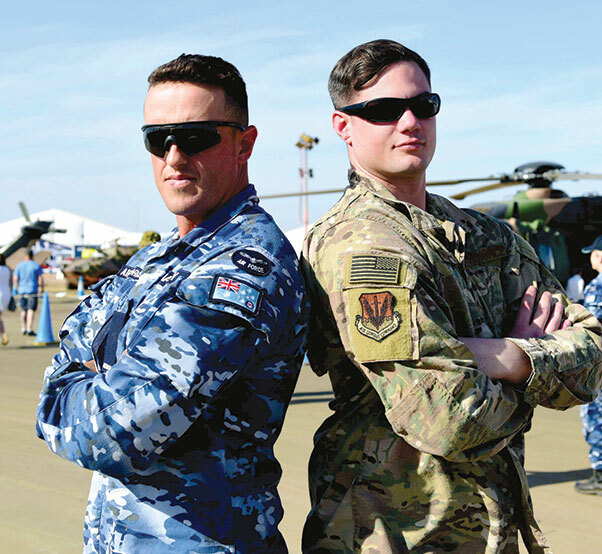 Leading Aircraftman James Bayley with the Royal Australian Air Force, and Staff Sgt. Joshua with the U.S. Air Force, display their national flags during the Australian International Airshow, Feb. 26, 2019, in Geelong, Victoria, Australia. 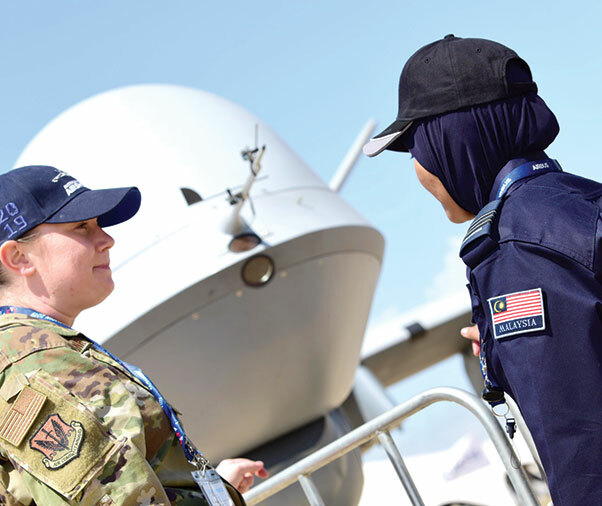 In line with the focus of strengthening the relationship between the Australian Defence Force and U.S. military, the U.S. Air Force and Creech Airmen brought the MQ-9 Reaper to be displayed during this airpower demonstration. 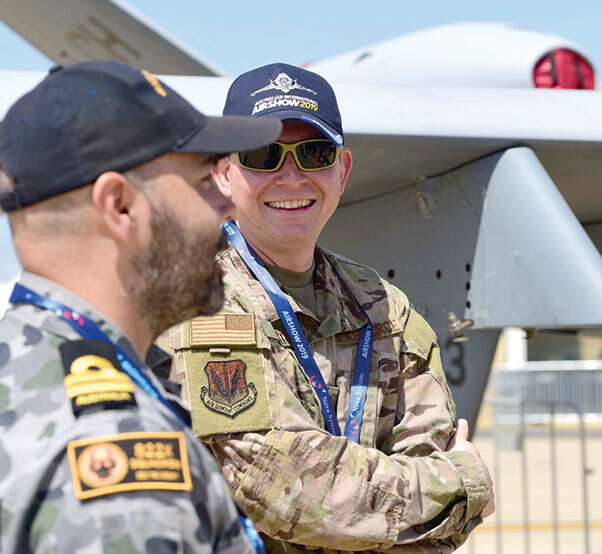 Airmen with the 432nd Wing/432nd Air Expeditionary Wing travelled to the Australian International Airshow in Geelong, Victoria, Australia, to display the MQ-9 Reaper for the Australian and international crowds, Feb. 26-March 3, 2019. Reaper crews have made their way across the United States to attend air shows such as this one, but this is their first time in the Pacific Air Forces Command area of responsibility and Australia. 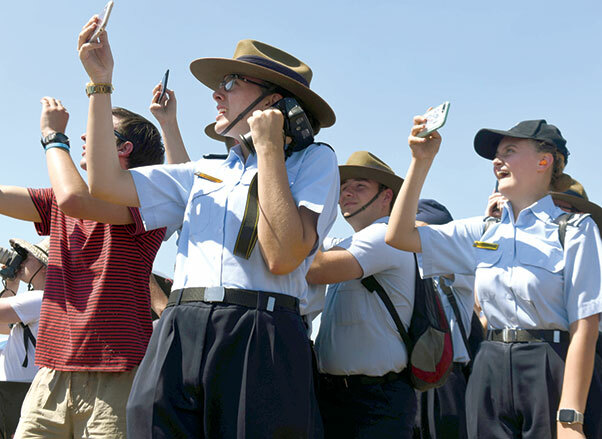 In line with the focus of strengthening the relationship between the Australian Defense Force and United States Military, the U.S. Air Force and Creech Airmen brought the Remotely Piloted Aircraft to be displayed during this airpower demonstration. Air show visitors raise their cameras to the sky to capture airpower in action during the Australian International Airshow, March 2, 2019, in Geelong, Victoria, Australia. Over the week, the Avalon Airfield hosted more than 200,000 visitors and aviation fans. Over the week, the crews met with many of the air show’s more than 200,000 visitors and aviation fans. The MQ-9 has proven to be a popular attraction due to its unique capabilities and the team’s mission of persistent attack and reconnaissance. “I was very surprised by how many people showed interest in our aircraft,” Christian expanded. Displaying the aircraft that changed the face of warfare for the Australian International Airshow is not only an opportunity to help RPA Airmen explain their role in national security, but also provides the chance for the U.S. Air Force to show their support for our coalition partners in the Indo-pacific region. Though this was the first air show MQ-9 crews have attended this year, the Reaper and its team are scheduled to appear at many more throughout the season. Master Sgt. 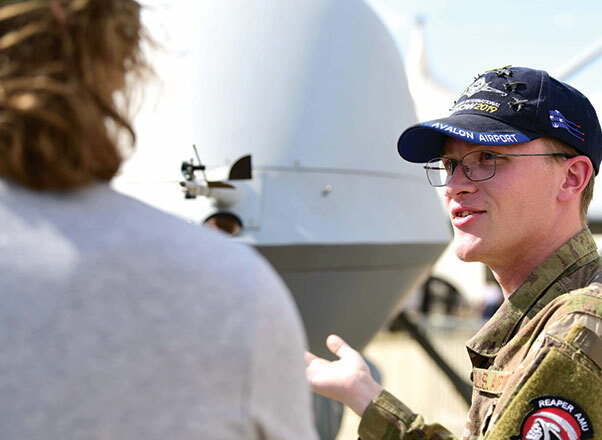 Daren speaks with a member of the Australian Defence Force about the MQ-9 Reaper during the Australian International Airshow, Feb. 26, 2019, in Geelong, Victoria, Australia. In line with the focus of strengthening the relationship between the Australian Defence Force and United States Military, the U.S. Air Force and Creech Airmen brought the Remotely Piloted Aircraft to be displayed during this airpower demonstration. Capt. Annabel Monroe, 432nd Wing/432nd Air Expeditionary Wing Public Affairs officer, talks with an air show visitor about the MQ-9 Reaper mission during the Australian International Airshow, Feb. 26, 2019, in Geelong, Victoria, Australia. Displaying the aircraft at the Australian International Airshow is not only an opportunity to help RPA Airmen explain their role in national security, but also provides the chance for the U.S. Air Force to show their support for our coalition partners in the Indo-Pacific region. Staff Sgt. Dylan, MQ-9 Reaper avionics craftsman, explains the effects of taking the cockpit out of the aircraft to an air show attendee during the Australian International Airshow, March 3, 2019, in Geelong, Victoria, Australia. Over the week, the crews met with many of the airshow’s more than 200,000 visitors and aviation fans. Capt. 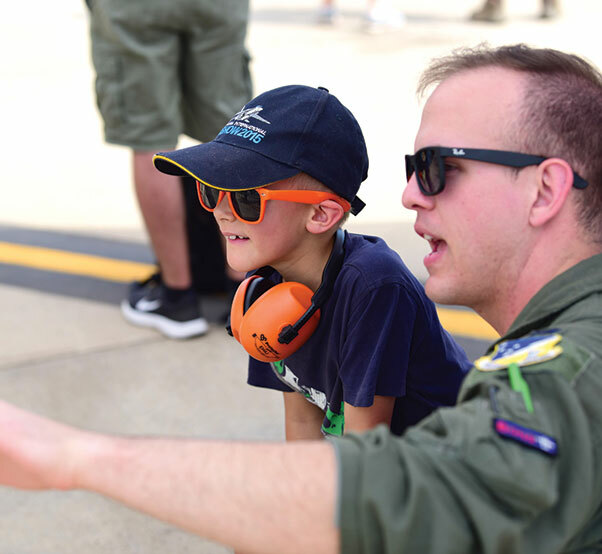 Daniel Bradfield, MQ-9 Reaper instructor pilot with the 49th Wing, talks with a child about the MQ-9’s capabilities during the Australian International Airshow, March 3, 2019, in Geelong, Victoria, Australia. Reaper crews have made their way across the United States to attend airshows such as this one, but this is their first time in the Pacific Air Forces Command area of responsibility and Australia. 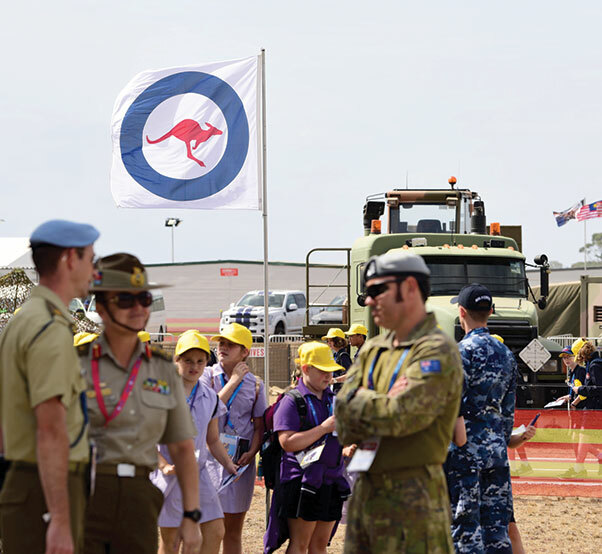 The Royal Australian Air Force roundel waves as air show attendees explore the Australian International Airshow, Feb 26, 2019, in Geelong, Victoria, Australia. In line with the focus of strengthening the relationship between the Australian Defence Force and United States Military, the U.S. Air Force and Creech Airmen brought the Remotely Piloted Aircraft to be displayed during this airpower demonstration.